When you are involved in an automobile accident, your first priority should be your physical recovery. Too often we see individuals who have been wrongfully injured unable to receive the compensation they are entitled too. Meeting with an experienced auto accident attorney can help ensure you get the help you deserve. At Simmons and Fletcher, P.C., our attorneys work on a contingency fee contract so our initial consultation is always free. 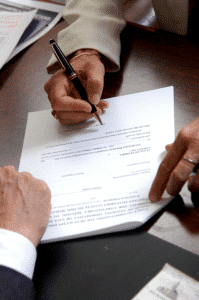 When meeting with an accident attorney for the first time, it is important to come prepared. This will not only save you time during your meeting, but allow you to focus on the other aspects of your accident. The following are pieces of information that will be helpful during an initial case evaluation. Any discharge papers, bills, receipts, explanation of benefits related to your medical care received. Simmons and Fletcher, P.C., has been representing accident victims since 1979. Our attorneys understand the financial, physical and emotional strain these accidents place on victims and their families. Call us today at 1-800-298-0111 to set up your meeting.